Looking for a bus in Northbrook? Chicago Charter Bus Company has access to hundreds of buses to take you to the River Trail Nature Center, Northbrook Court, and more. Just because you live near Chicago doesn’t mean you always want to drive into the city. Especially if you’re attending a Chicago wedding or a Chicago Bears game with your fellow fans, the thought of having to drive afterwards is probably pretty anxiety-inducing. For celebratory events in Northbrook, Chicago, or surrounding areas in Illinois, consider hiring a personal chauffeur with Chicago Charter Bus Company. Not only will you have a professional designated driver behind the wheel when too much champagne flows, but you will also enjoy the perks of not having to park a few cars on Chicago’s congested city streets. 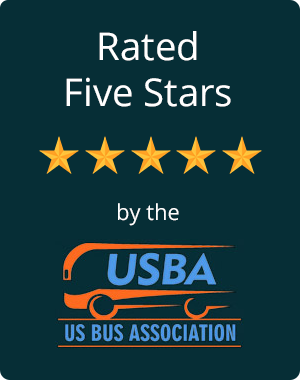 Everything is handled for you when you book with Chicago Charter Bus Company, so you can enjoy momentous life events with no qualms about how you’re getting there or how you’re getting home to Northbrook. Let us make small group travel simple for you with minibuses that can fit up to 25 passengers. For big groups hitting the road and heading farther than Chicago, you might want to book a 56-passenger charter bus. This is the largest bus in our network, and it comes equipped with everything you could want during a long road trip. Ample storage space, comfortable seats, and plenty of legroom ensure a smooth ride for every passenger. If you think your group might not need such a large bus, though, check out some of the other buses we charter. Chicago Charter Bus Company is happy to assist a variety of group travel needs in the Northbrook area. Our most popular services including wedding shuttles, educational field trips, airport shuttles, convention transportation, and sports team travel. We recommend customizing your bus to fit the occasion—these modern, stylish vehicles can be transformed into one-of-a-kind vessels for your unique experiences. These additional upgrades for your vehicle can include personal AC adjustments, DVD players, and extra legroom. Ask your booking specialist for more amenity options for your bus or minibus rental. You'll also have the option to travel within Chicago or in other surrounding neighborhoods such as Elmhurst, Glencoe, Highland Park, Winnetka, and more. We make it easy to transport your group to every stop on your itinerary, whether it's in the city or in the suburbs. Curious what it’ll cost to rent a bus or minibus with a private chauffeur in Northbrook? You can view average pricing here to get a general idea, or, if you want more accurate pricing information, feel free to call us any time at 312-667-0906 for a customized quote. You’ll receive an affordable bus rental quote within minutes, and if you want to be book right away, we’ll be ready! Our booking specialists are available to talk travel plans 24/7, so don’t hesitate to reach out to us with any questions.